Dancing to live music is just one form of entertainment at Last Thursdays. This year’s events are June 28, July 26 and Aug. 30. 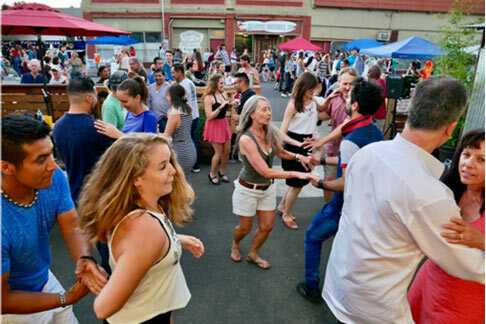 Get ready for another summer of fun, art and delicious food at Last Thursdays on Alberta! Some of the highlights this season include: more local art, new and free interactive activities, and a special Native American culture and art area. We are especially excited for a new Native American crafting circle at 21st Avenue, three special interactive installations from Alberta Art Works and several Portland-themed mini-golf holes that will be free to play. Please come and support the local artists who bring their wares to share with the community. Last Thursday continues to be a fun and engaging place to buy local art, sample delicious cuisine and enjoy a car-free stroll down the street. This summer’s street vending and performance events will take place on June 28, July 26, and Aug. 30. Alberta will be closed to motor vehicles from 15th to 30th avenues from 6 to 9 p.m. When you go, keep your eye out for the interactive Last Thursday art booth. During all other months of the year, Last Thursday art openings and events are celebrated in the brick and mortar stores along Alberta Street. Last Thursdays are produced by the same team at the Portland Bureau of Transportation that brings you Sunday Parkways. For additional information, please contact me at Greg.Raisman@portlandoregon.gov or 503.823.1052. Greg Raisman is a Livable Streets Program specialist with 17 years of experience at the Portland Bureau of Transportation. He manages Last Thursdays, helps produce Portland Sunday Parkways and supports the large painted intersections in neighborhoods around the city. When he’s not building community, find him enjoying local restaurants and breweries.